A pulley is a simple device designed to make it easier to lift a heavy weight by changing the direction of the force that must be applied to move the object. The most basic type of pulley is simply a rope and a wheel, however there are three different types of pulleys and the physics for each type of pulley are somewhat different. There are three basic types of pulleys: fixed pulleys, movable pulleys and combined-pulley systems. 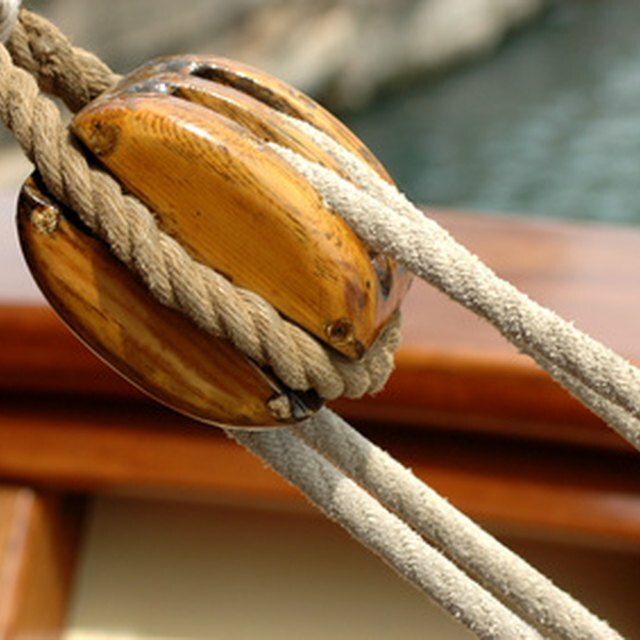 A fixed pulley is a wheel hanging on a rope from an object such as a beam. A rope is draped over the wheel and one end is attached to the object to be lifted. The other end is pulled down to lift the object. A fixed pulley remains in the same place when you lift the object. A movable pulley is hung in such a way that it moves when you lift the object. A combined-pulley system is made by running the rope through two or more pulleys. Simple physics calculations can be used to determine the effectiveness of a pulley system. A fixed pulley does not reduce the amount of force needed to life an object. If you attach one end of the rope to a 50-pound block, you still have to apply at least 50 pounds of force to lift it when you pull on the other end -- and in reality you need slightly more, since you also need to move the rope and overcome friction. In terms of physics, the fixed pulley does not provide any mechanical advantage. Movable pulleys allow you to lift a load with less effort than fixed pulleys, so they do produce a mechanical advantage. However, they are still less efficient than combined pulleys, which work by distributing the force among the different sections of rope. Combined-pulley systems work by distributing the force needed to move the object. In a system with two pulleys, the rope is divided into three sections. One section goes down from the ceiling to the first pulley, where the weight is attached. The second section goes from the first pulley up to the second pulley at the ceiling. The third section goes from the second pulley down to the person pulling the rope. If the object weighs 300 pounds, it would normally require 300 pounds of force to move it. 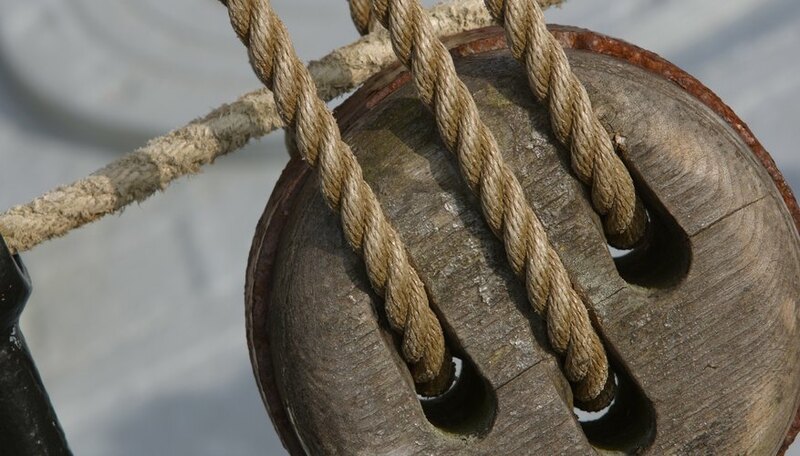 However, with this combined-pulley arrangement, each of the three sections of rope takes one-third of the force, so the total force needed to move the object is only 100 pounds. This can be expressed as a physics calculation: L equals F times the number of sections in the rope. L equals the weight of the load and F equals the amount of force. Using the simple physics formula of L= F times the number of segments in the rope, it is easy to calculate the amount of force needed to lift a heavy object with a pulley system. If the rope is divided into four sections by your pulley system, then the force you exert on the other end will be multiplied by four. For example, if the object to be lifted weighs 1000 pounds and you exert 250 pounds of force on a pulley system with four rope sections, then you will be able to lift the object because 1000= 250 times 4. However, the distance the object must be lifted is also multiplied by the same number, so instead of lifting 1000 pounds a certain distance, you would be lifting 250 pounds for four times as much distance. For this reason, pulleys are not very efficient devices despite the mechanical advantage they produce. Thompson, Scott. "The Physics of Pulley Systems." Sciencing, https://sciencing.com/physics-pulley-systems-10051530.html. 24 April 2017.